NEWS: Vote for Bunjil Place! Bunjil Place has been shortlisted at the FRAME Awards – World’s Best Interiors. The People’s Choice award is now open! 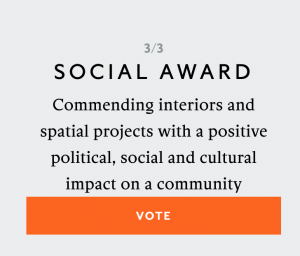 We entered the “SOCIAL AWARD” category: Commending interiors and spatial projects with a positive political, social and cultural impact on a community. Cast your vote using this link! (*To vote, scroll down until you reach the Societal Awards – Social Award section and click on the orange button). The Frame Awards is the first and only global interior-design awards with a truly holistic approach. The Awards identify and honour the world’s best interior projects, but also the people behind them. The work is judged by all industry stakeholders: interior designers, architects, retail brands, hospitality providers, cultural institutions, and educators. In total 34 awards are divided under Spatial, Executional, and Societal Awards covering the entire spectrum of interiors, while the Honorary Awards celebrate the people behind them.